This disaster of the Cherokees, brought to me by a sad friend to blacken my days and nights! I can do nothing; why shriek? Why strike ineffectual blows? I stir in it for the sad reason that no other mortal will move, and if I do not, why, it is left undone. The amount of it, to be sure, is merely a scream; but sometimes a scream is better than a thesis. Yesterday wrote the letter to Van Buren, — a letter hated of me, a deliverance that does not deliver the soul. I write my journal, I read my lecture with joy; but this stirring in the philanthropic mud gives me no peace. I will let the republic alone until the republic comes to me. I fully sympathize, be sure, with the sentiments I write; but I accept it rather from my friends than dictate it. It is not my impulse to say it, and therefore my genius deserts me; no muse befriends; no music of thought or word accompanies. “This disaster of the Cherokees” was the Trail of Tears. Ralph Waldo Emerson did not “let the republic alone” for long. His “Cherokee Letter” to President Martin Van Buren is dated April 23, 1838, and it’s quite a dissertation. You can read it online on the Official Site of the Cherokee Nation, along with A Brief History of the Trail of Tears. 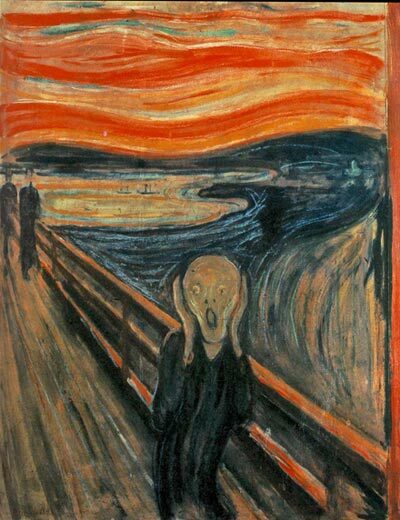 I first learned about Munch’s The Scream in a high school Art History class. At that point I did not understand it on a personal level. I related it to history, in the same way my attempt to be psychologically tidy relegated the Holocaust to history, though I had seen the ovens and survivors firsthand. I was young. Even a lampshade of human skin did not seem like it could relate intimately to anyone I would know in my future. My tidy sense of history split open, when, as a young adult, I learned that seven generations back my ancestors had owned slaves. One side of my family does not speak of this. I’d finally met the other side and listened to their stories, my family stories. My world became bigger, more painful, more confusing, and more grounded. A few years later I had another Scream lesson, when a friend who was researching her ancestors told me about a Cherokee grandmother whose ancestors included Trail of Tears survivors, as well as someone who had come over on The Mayflower. Her “Trail of Tears plus Mayflower” was a solid connection between supposedly different groups – and again my world became bigger, more painful, more confusing, and more grounded. Her story made me think of the first time I met a “real live Indian,” as far as I knew at the time. He was an older man who used to sit inside a tipi replica at a museum – the Institute of Texan Cultures, I think. We went to museums a lot, and while my family wandered through the rest of this one, I usually scampered off to one special place, to sit by my “my friend,” if he was there. I liked to sit by him because I missed my grandfather, and he seemed like he was lonely, too. I wanted to take him home. Forever. And I have never forgotten him. That was 36 years ago, just before the American Indian Movement siege of Wounded Knee. This is what I think, now, when I look at The Scream. Though he is stopped in his tracks at the moment, he is on a path, and that suggests a past and a present, and a future after whatever is so unmentionable. In the past there are two dark figures, together in obscurity, possibly comforting each other, but not within reach of the screamer and not reaching out for him in the least. The screamer is closer to the viewer, and the viewer is directly in the screamer’s path. The viewer could be why the screamer screams. Are we monsters? If the screamer moves forward, his eyes may meet our own. Do we dare? Or will we step aside, comforting each other, avoiding his pain?